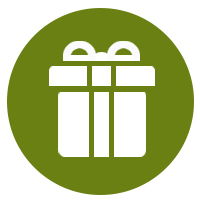 With all of the talk about gifts for friends and loved ones this holiday season, we'd like to remind you to spread the love to your website as well. Each day up until Christmas we'll give you a simple idea you can implement to spread the love to your website. Content editing on a website is a big job. But, if taken a small task at a time, it becomes manageable. Many of the tasks below are site-wide and will easily be changed in the CSS code of your website. One change will modify all of the content on your website. Be sure you're using font/background colors that are easy-to-read. This seems obvious, but there are certainly a few offenders out there still. Having trouble reading this text? Don't do this to your audience. The text on your website should not be too small that it's difficult to read. Also, the paragraphs on the site should not be too lengthly. A good rule of thumb is no more than 6 sentences per paragraph. Of course there are exceptions, but it's a good general guide. Use bulleted lists or numbered lists help to keep the content skim-able. Content that is easy to scan is more likely to be read in its entirety. Finally, be sure to add sub-headings where appropriate. Compelling content is content that asks your audience to act. A call to action is essential to help your audience perform your desired action; whether it's subscribing to your blog, downloading a white paper, or signing up for your newsletter. Remember that the Calls to Action that are the smallest steps forward (i.e. subscribing to a newsletter) will have a better chance at success. Whereas a big leap forward (i.e. contact forms) are more difficult to get a potential customer to do on their first visit. Links on your website need to be working properly in order to keep your audience happy. There is nothing worse than a broken website. As you add links to your website you should test the links to be sure they are actively working. In addition, many large websites subscribe to a link checking service that periodically follows all of the links on a website to ensure they are still working. Then, any links that are broken will be sent in an email to the website owner. This makes managing a bigger website a lot easier. We've all had a spelling error from time to time, but consistent spelling issues are website hangups as well. Most browsers have a spell check integrated, now. However, if yours does not, be sure to pass the content through a spell check before going live. In addition, after writing content, step away from your desk for a moment or so. Then, come back and read what you're just written once more before publishing. Remember, your website is an extension of your brand! Always put your best face forward. Stay tuned for more gift your website ideas. You've decided to take the plunge into social media. Congratulations! Or, if you're one of the few that has been too afraid to put your toe in the water, go ahead and give it a try in 2013! Once you've begun using social media, get the word out! Put some small buttons with links to your social media haunting grounds. Or, better yet, put a feed of your Twitter or Facebook updates on the sidebar of your website. This gives your audience a taste for what they'd be missing out on if they don't follow you on social media. Quality content is always better than quantity content. Social Media is about being a gift to others; the focus shouldn't be on you. Remember, link up your social media outlets to help your audience connect with you! We are a visual people. A picture truly is worth a thousand words. So, don't torture your audience by uploading original photos to your website. A picture's resolution is the number of tiny dots (pixels) per inch. The higher the resolution, the sharper the image. This matters BIG TIME if you're printing a photo or creating a billboard. However, computer screens are setup to display 72 pixels per inch. No more. Secondly, most photos for your website can be much smaller than the originals from a digital camera. If you're not sure of the image size, a great way to find out is to open an existing image from your website. Right-click the image and select "Open Image In New Window". In many browsers, the image name and pixel dimensions will be displayed just above the address bar on your browser. If you're a pro, you may have Adobe Photoshop or Photo Elements. If not, simply do a search for "image resizing" and you'll find a number of free and paid solutions. There's no more excusing a website with slow load times. Image resizing takes just a couple quick minutes when you're uploading a new image to your website. So, do your audience a favor and take care of those pixel-heavy images. Another quick fix is to ensure your contact information is on every page in addition to the Contact Us page of your website. An easy way to do that is to include contact info on the footer of your website. Another great way for people to connect with you is on social media. Be sure to include links to the various social media platforms you are active on. How many visitors come each month? How are they finding my website? What websites link to mine? What search terms are they using to find me? What pages are they visiting most often? The information here will paint a very clear picture of how your website is doing. Most websites come standard with an analytics program. If you don't have one, check out Google Analytics. It's free and only takes a snippet of code to be added to your site to begin your analytical journey. Warning: Once you begin checking out your website stats, you may become addicted to the powerful data therein.